It has nothing to do with cooking everything on Sunday. 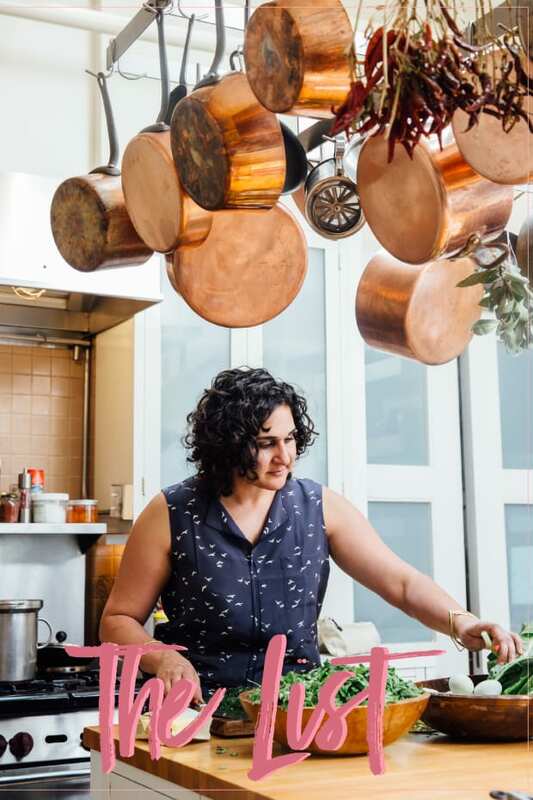 I love the idea of meal planning on Sunday—diligently roasting several pans of vegetables, freezing salmon in a marinade to be thawed for a balanced mid-week meal—but when it comes down to it, I&apos;m rarely able to carve out three hours on the weekend to cook for the week ahead. I have a knack for finding about a thousand other tasks and events that are more important (or, to be honest, more fun). But the truth is that you don&apos;t need to dedicate half of a Sunday to meal planning. With a little strategy and careful recipe choices, you can "plan" as the week goes on. 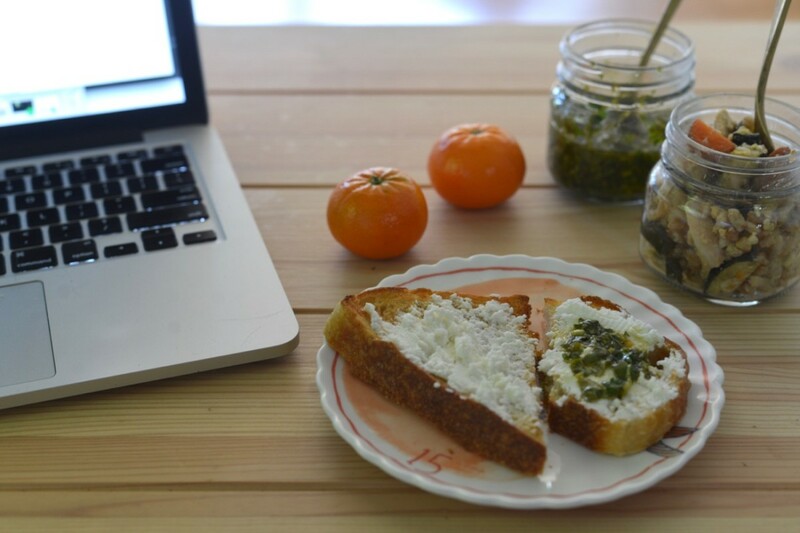 The idea is to choose every dinner recipe with at least two additional meals in mind (the following lunch and dinner), so that you can strategically use the leftovers to create new meals. Every Monday morning, I choose two to three recipes I want to make, then map out the rest of the meals from there. In the case of the week photographed below, I chose 1. Potato salad, 2. Roasted Lemon and Nectarine Chicken, and 3. 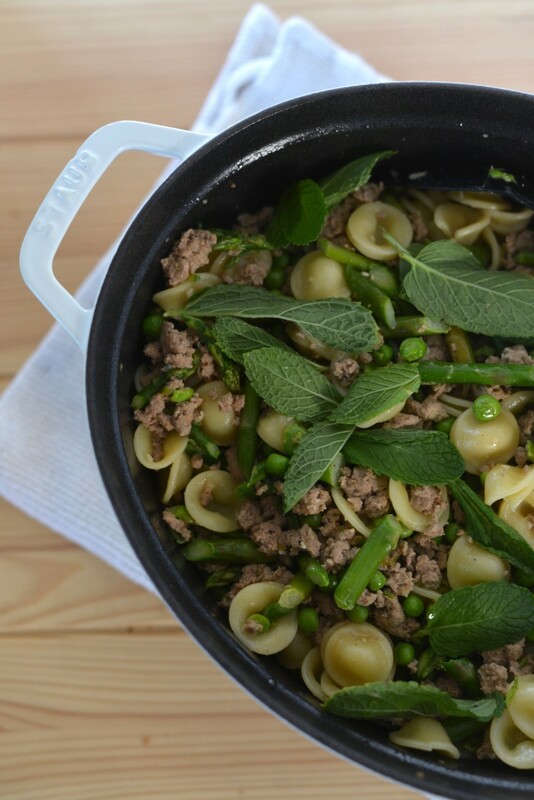 Turkey Sausage Orecchiette. Then I write out a list of every ingredient and map out creative ways to use the leftovers from each meal for entirely new dishes. For example, the nectarine chicken turned into "fried farro," and the turkey sausage from the pasta dish went into turkey chili. The added challenges here are making sure to use every ingredient so that you aren&apos;t wasting anything, and maximizing your time by multitasking. For example, if you boil potatoes, remove them with a slotted spoon, then add eggs in for the next day&apos;s lunch, or if you already have your chopping board out for dinner, look ahead and see if you can also prep for a future meal. Below is a week of real lunches and dinners I made using this strategy. They aren&apos;t particularly ground-breaking, but each one is a delicious, made-from-scratch meal with minimal active time. Enjoy! Note: Each recipe yields enough food for two people since I recorded the portions and ingredients while cooking for myself and my boyfriend, but any of them can be tailored to yield more or less. In creating the meals, I tried to choose things that are easy and full-time work schedule-friendly, healthy, in-season, and affordable, though you can cut a few things out, like salmon, to make it even more so. Whenever an ingredient was over $10, I indicated in parentheses how much it cost. Monday lunch is when I find myself most susceptible to throwing a very sad but get-the-job-done peanut butter sandwich or power bar into my purse (which isn&apos;t the most inspiring way to start the week). 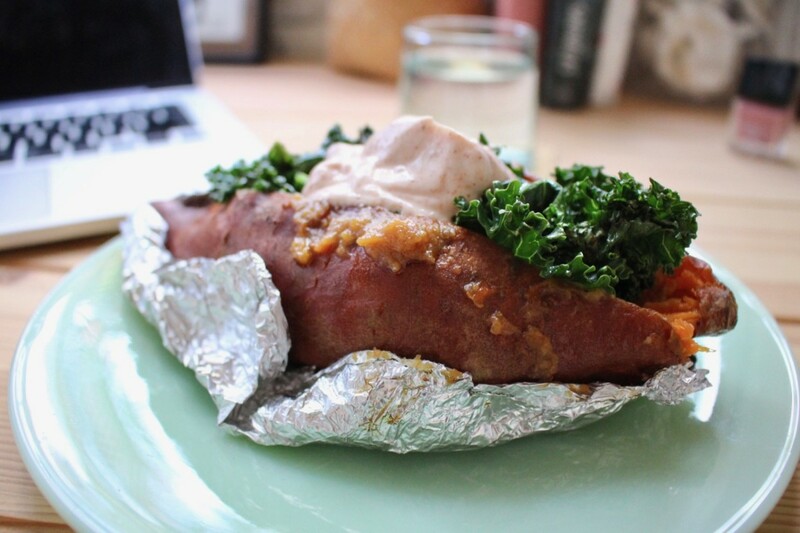 Whenever possible, I&apos;ll try to make extra of whatever I&apos;m cooking on Sunday, but when that doesn&apos;t work, I opt for something with minimal active cooking time, like this baked sweet potato. It&apos;s hardly the most exciting lunch you&apos;ll ever eat, but what it lacks in originality it makes up for in only six ingredients and ease. Note: I usually wake up early enough that I have time to make this in the morning, but if you aren&apos;t a morning person, plan accordingly and prep the night before! 1. 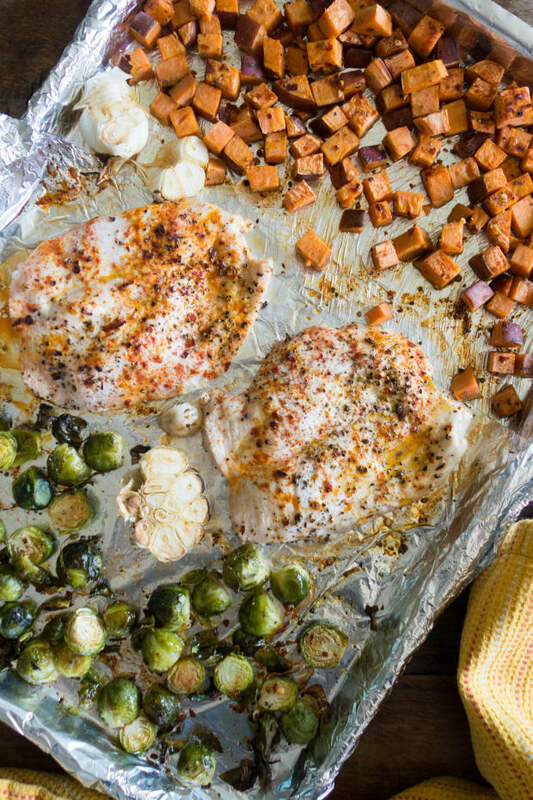 Preheat the oven to 375° F. While it comes to temperature, prick the sweet potatoes all over with a fork and place it on a square of aluminum foil, just large enough to cover it. Drizzle with olive oil, using your hands to rub it all over the potatoes, then wrap the foil around it and place it in the warmed oven. 2. Allow the sweet potatoes to bake until tender (roughly 30 to 40 minutes) while you make yourself a pot of coffee, hop in the shower, and get ready for work. If you&apos;re in a rush, you can also microwave your potatoes to bake them. 3. Remove the potatoes from the oven, cut each in half lengthwise so that it opens like a book, and spread the miso on each side (if you have time the night before, I highly recommend you make this miso-scallion paste, but no need to get fancy—this is a Monday, after all). Put them back in the oven for 10 minutes. While they bake, mix together the Greek yogurt and paprika and pack in a separate container. In a small pan, add olive oil over medium heat and, once warmed, add the kale and cook until wilted, roughly 4 minutes. Again, if you&apos;re feeling fancy, you can add a few drops of fish sauce and some garlic to your kale. 4. Once the potatoes are cooked, place each in an air-tight container, alongside your sautéed kale and paprika-Greek yogurt. 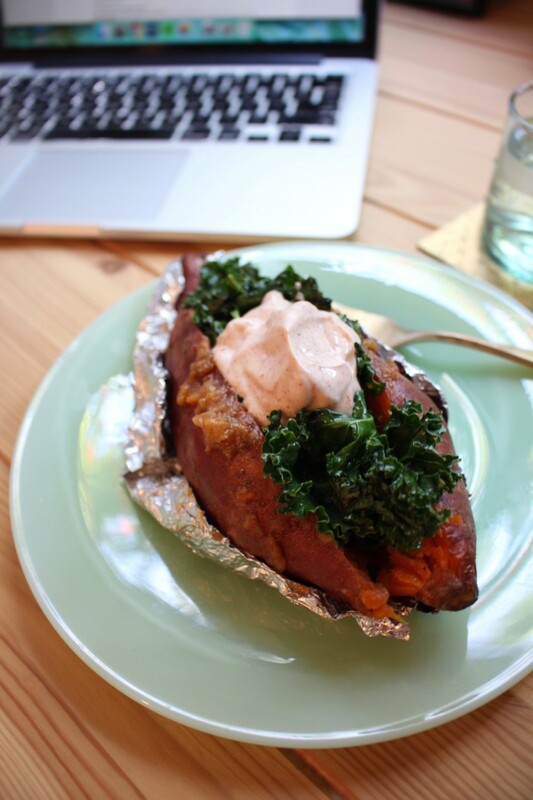 At lunchtime, butterfly-open the potato and layer it with the wilted kale and yogurt. Mondays are always a little more hectic than other days, so I like to make something that&apos;s easy but also feels like a fun reward for getting through the first day of the week. 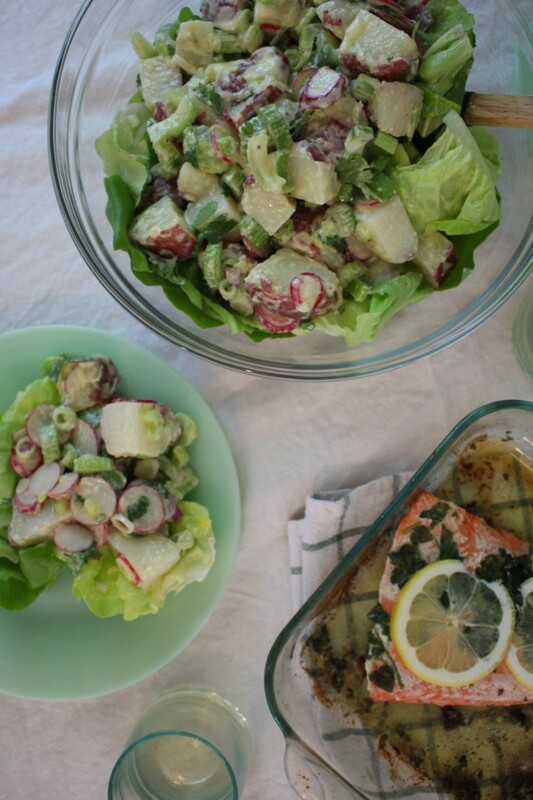 This potato salad is the perfect medium for showing off springtime vegetables like radishes and scallions. 1. Preheat oven to 475° F and bring a large pot of salted water (enough to just cover the potatoes) to boil on the stovetop. 2. While both come to temperature, chop the entire head of cilantro. 3. Add roughly 2 tablespoons chopped cilantro and the butter into a baking dish (put the rest of the cilantro away in the refrigerator), and place it into the oven until the butter melts and begins sizzling, roughly 3 minutes. 4. While the butter melts, chop the stem off of the butter lettuce and tear the leaves into slightly larger than bite-sized pieces, then rinse, drain, and pat dry. Place in a large bowl and set aside. 5. Remove the pan of melted butter from the oven and add the salmon, skin-side up. Place back in the oven, with the salmon, for 5 minutes. Use tongs to remove the skin, flip the salmon over, and put back into the oven for another 3 minutes. Remove from the oven and tent with foil to keep warm. 6. Once the water comes to a boil, use a slotted spoon to add the whole potatoes. Let cook until fork-tender, roughly 18 to 20 minutes. 7. For tomorrow&apos;s lunch: After removing the potatoes, bring the water back to a boil and add in 4 eggs. Cook for 8 to 9 minutes (overcooked hard-boiled eggs are chalky and altogether not a great experience, so err on the side of 8 minutes and slightly runny yolks, unless you prefer them cooked longer!) then use a slotted spoon to transfer them to an ice bath. 8. In a small bowl, use a fork to whisk together the olive oil, mayonnaise, and mustard. Set aside. 9. Once the potatoes have cooked, use a slotted spoon to remove them from the water, pat dry, then cut into bite-sized pieces and place into a large bowl. Top with the apple cider vinegar, then add the mayonnaise sauce and toss to coat (you may not need all of it). Add the sliced vegetables and toss. 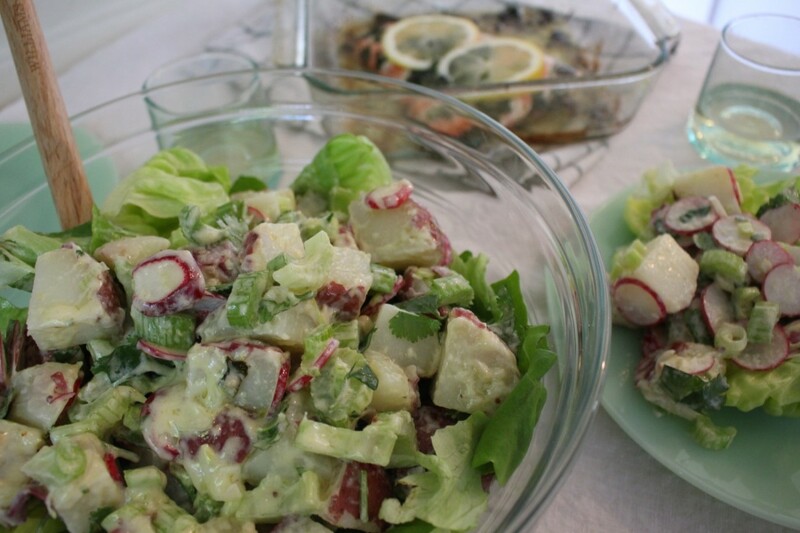 Reserve enough potato salad for tomorrow&apos;s lunch, then place the rest over the bed of lettuce. Serve salmon with thinly sliced lemon on top. 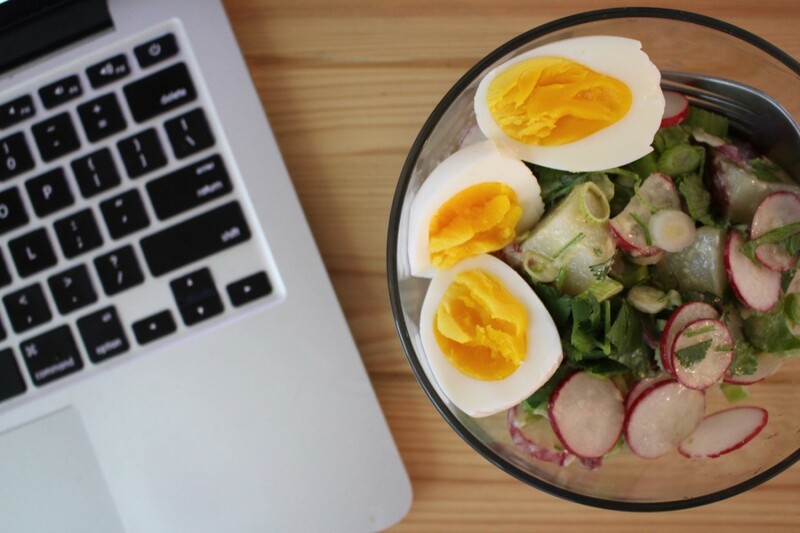 My favorite way to add protein to any lunch is with a hard-boiled egg. Their shell acts as a natural "tupperware" so I can easily throw them in a container with any salad. This one&apos;s easy! 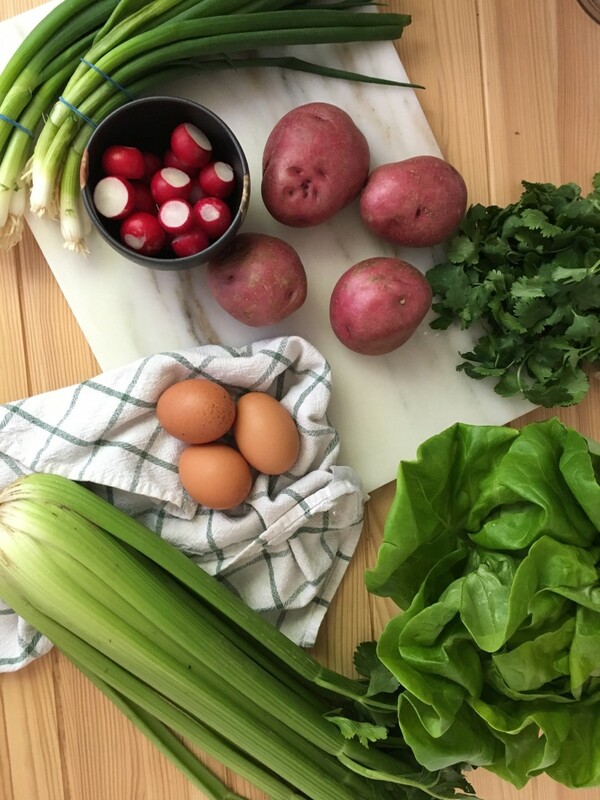 Since you made the hard-boiled eggs last night (see recipe above), simply pack them (unshelled, so they don&apos;t get stinky or squished) in the same container as your potato salad. 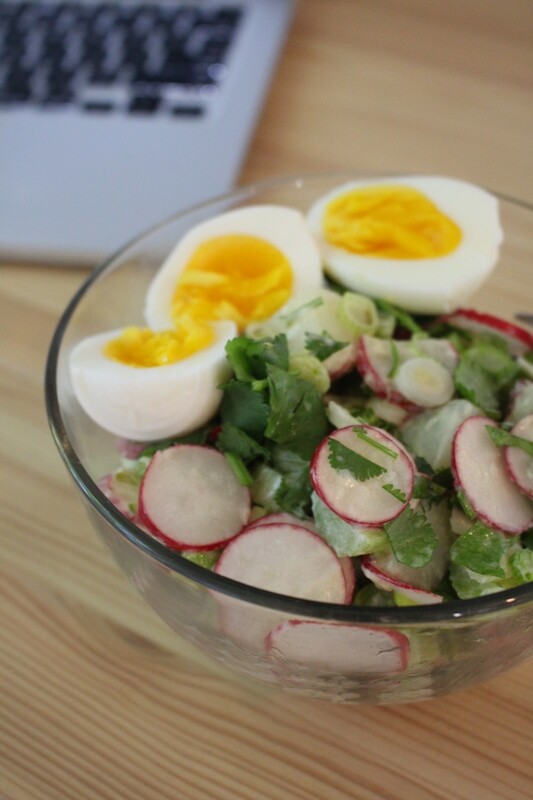 At lunchtime, peel your eggs, slice them in half, and serve on top of the salad. Roast chicken is truly a weekday warrior since it easily transforms into leftovers like chicken salad, soup, and fried rice. I usually make an entire chicken (this recipe is my favorite) so that I have leftovers, but I&apos;m sharing one of my favorite recipes for chicken breast so I can show you a wider range of recipes—and that chicken breast doesn&apos;t always have to be "boneless and skinless." 2. 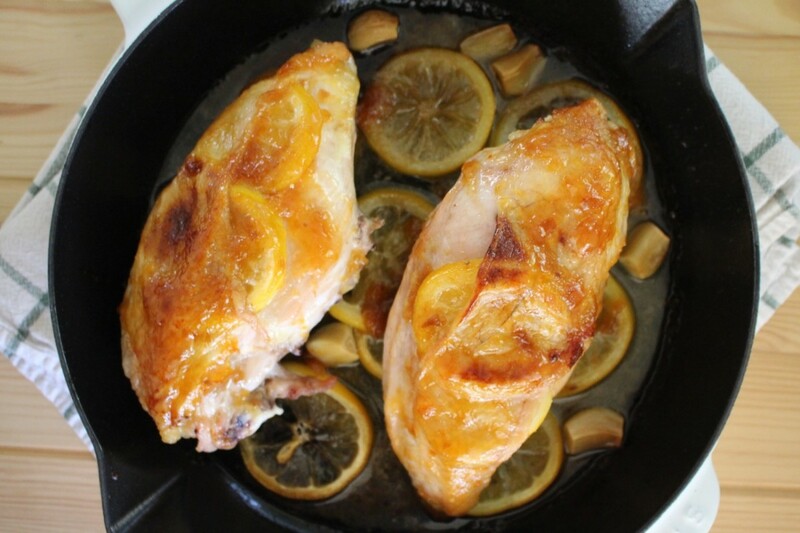 Slice one of the lemons into rounds and place several slices (about 6) in a single layer along the bottom of a cast-iron skillet just large enough to hold two chicken breasts. Peel all of the garlic and place 10 of the cloves interspersed with the lemon. 3. Rinse and pat dry the chicken breasts, then use your fingers and a paring knife to lift the skin up enough so that you&apos;re able to put two sliced lemon rounds and several thin pats of butter under the skin (this makes it crispy, and the meat slightly lemony). Rub any remaining butter on top of the chicken and add a dash of salt, then place the breasts in the pan over the lemon and garlic. Once the oven comes to temperature, place the chicken in and cook for 30 minutes. 4. In a large pot, boil the farro according to the package instructions. Once cooked, you can set aside most of it for future meals later in the week, and keep 1 cup (1/2 cup serving per person) for this dinner. 5. 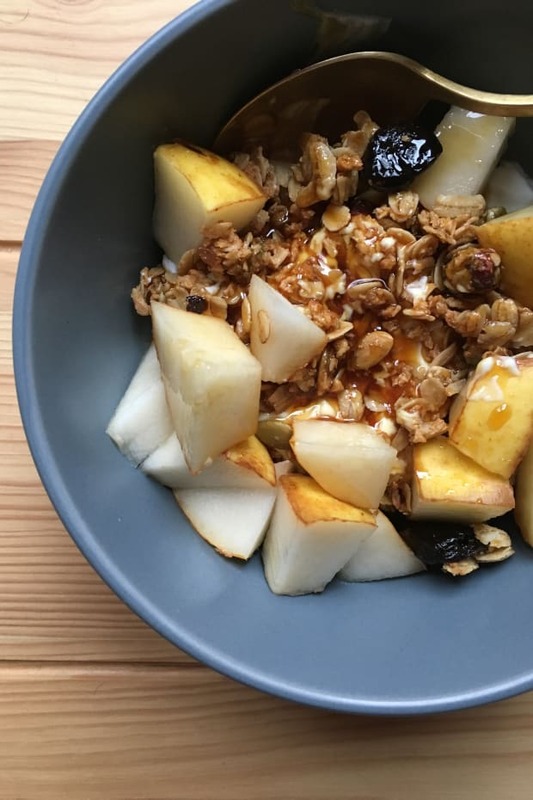 In a medium-sized bowl, use a fork to whisk together the fruit jam, vinegar, and honey. Once the chicken has baked for 30 minutes, use a large spoon to evenly spread half of the jam mixture over the chicken, then return to bake for another 15 to 20 minutes, or until the internal temperature registers 165° F on a meat thermometer. 6. While the chicken bakes, slice the remaining 2 cloves of garlic thinly. Add a glug of olive oil to a medium-sized pan and once shimmering, add the garlic and cook until just barely golden over medium heat. Add the spinach and cook until wilted, about 2 minutes. 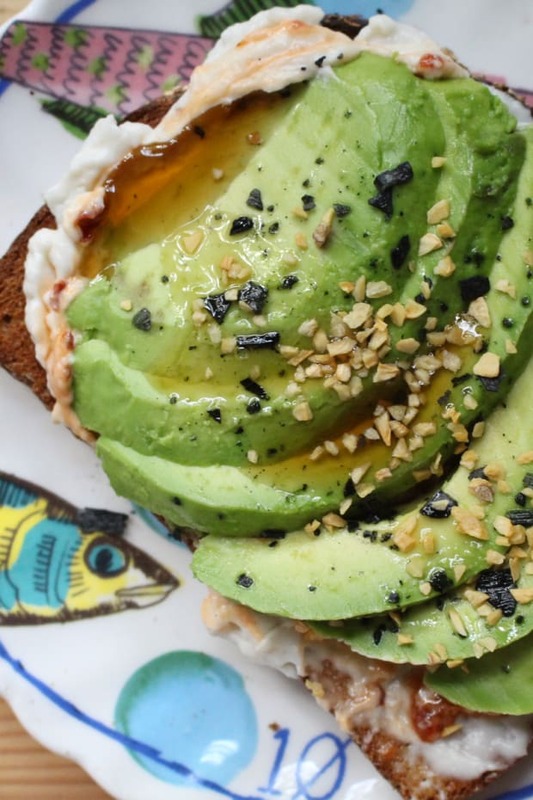 Serve with a lemon wedge and some nutmeg (optional, but delicious). 7. To serve the chicken, carve both breasts and divide one evenly between two plates, and put the meat from the remaining breast in an air-tight container in the refrigerator. 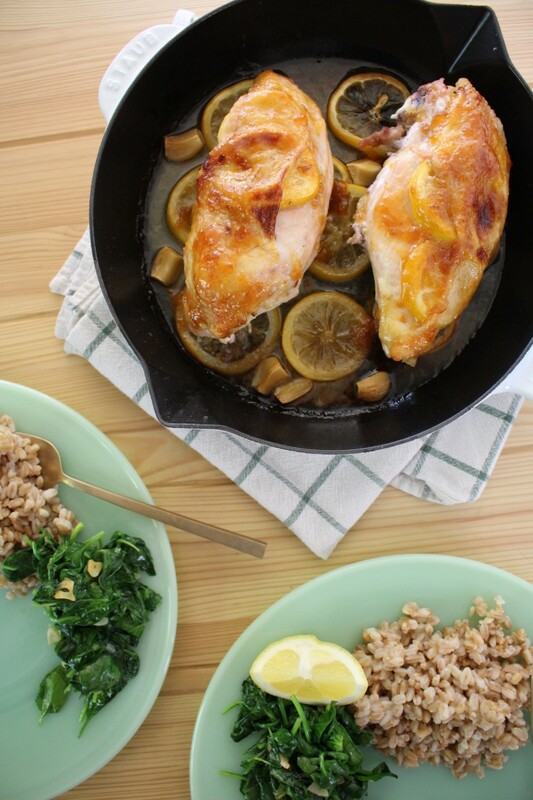 Spoon sauce, lemon, and garlic cloves on top of the chicken, and serve with the farro and spinach. 8. 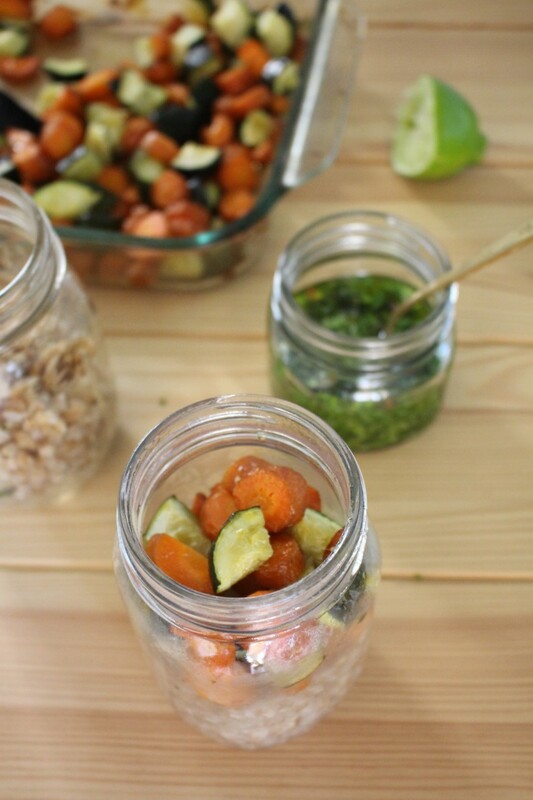 For tomorrow&apos;s lunch: Add the cilantro, lime, red pepper flakes, and olive oil to a mason jar and shake to combine. Add salt to taste. Add the zucchini and carrots to a medium-sized baking dish or rimmed baking sheet, drizzle and toss with olive oil and salt, and place in the 375° F oven (which should still be hot from the chicken). Bake for 30 to 40 minutes, or until tender, remove and allow to cool before storing in the fridge for lunch tomorrow. When in doubt, you can never go wrong with roasted vegetables and rice for lunch. To make things a little more interesting, add the cilantro sauce on top before serving. 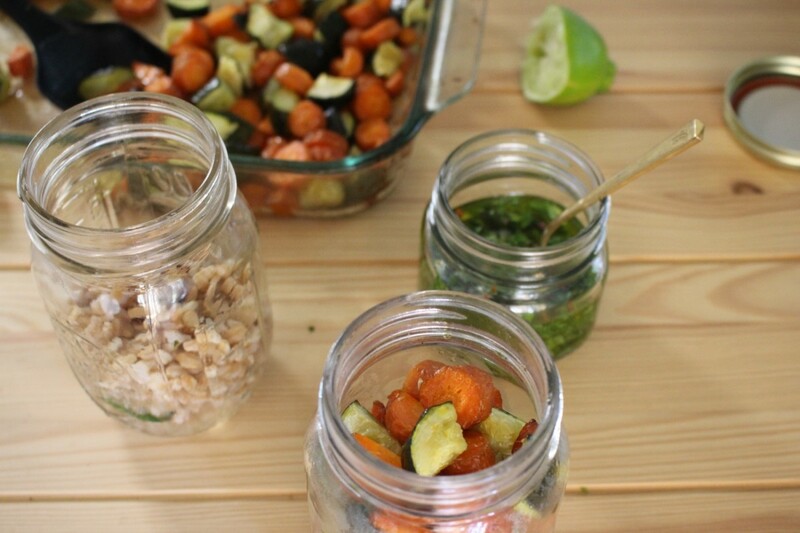 Pack up your rice and roasted vegetables in an air-tight container, and pack your sauce separately. 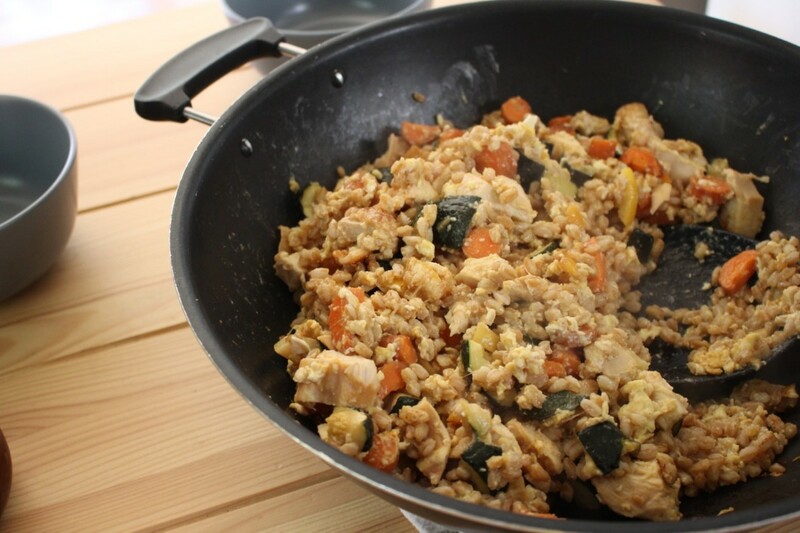 At lunchtime, reheat the rice and vegetables, then pour the sauce over top. Fried rice is the easiest way to revive roast chicken and vegetables. 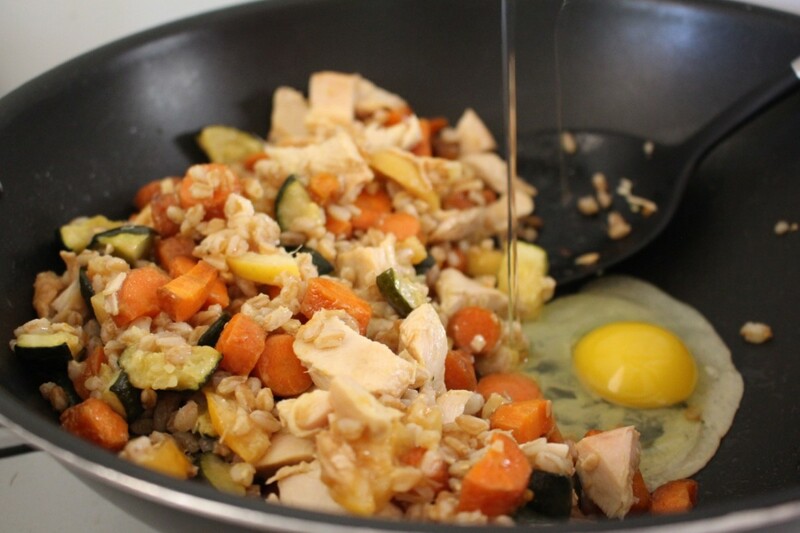 Just throw &apos;em in a wok with some farro or rice, chicken broth, eggs, and soy sauce, and you&apos;re done! 1. In a large pan or wok (if you have one), add the farro and vegetables and cook under low heat, stirring occasionally, until warm. 2. While the farro mixture warms, take the chicken (and roasted lemons, if there are any leftover) and cut them into bite-sized pieces, then add to the farro and cook until warmed through. 3. Add about 1/4 cup chicken broth and continue to cook. 4. Use a spatula to move most of the rice mixture to the side of the pan, and add a glug of olive oil to the empty space in the middle. Once the olive oil begins to shimmer, crack 2 eggs into it, then use a spatula to scramble the eggs. Once they&apos;re mostly cooked, mix in the rice mixture. At this point, you can add an extra egg, depending on how eggy you prefer your fried rice. Add soy sauce to taste (I usually use 2 to 3 tablespoons) and more chicken broth if desired. Serve piping hot with your favorite Asian sauces! 5. Save a quarter to half of it for tomorrow&apos;s lunch! I usually have one lunch a week that&apos;s a hodgepodge of leftovers I haven&apos;t quite used up. In these cases, I do my best to keep things interesting, with some toast and fresh fruit. Promise to make up for it with tonight&apos;s dinner! Thursday night is the perfect opportunity for one final big night of cooking before an easy pre-weekend meal. As a side note, making sausage may sound intimidating, but I promise it&apos;s as easy as it gets (at least in this case, since there&apos;s no casing involved!). It&apos;s a perfect make-ahead meal component that can last for days without feeling boring. The sausage you make for this meal will be eaten in the next three meals in completely different ways. Note: You can also use lamb sausage here, but I used turkey since it&apos;s slightly more affordable! 1. To make the sausage, combine all of the sausage ingredients except the ice water in the bowl of a stand mixer fitted with a paddle attachment. Mix on low until just combined, about 30 seconds. Add the water a tablespoon at a time until the mixture comes together a bit, about 1 minute. 2. Divide the sausage into 1/2 pound and 1 1/2 pound. Set aside the smaller portion. Save the larger portion for Friday&apos;s meals by placing it in the refrigerator in an air-tight container. 3. To prepare the asparagus, cut or snap into bite-sized pieces, discarding the woody ends. Bring a pot of salted water to boil, and pour the asparagus in to blanch until just tender, 2 to 3 minutes. Pour into a colander placed in the sink, then run cold water over them. Drain and set aside. 4. 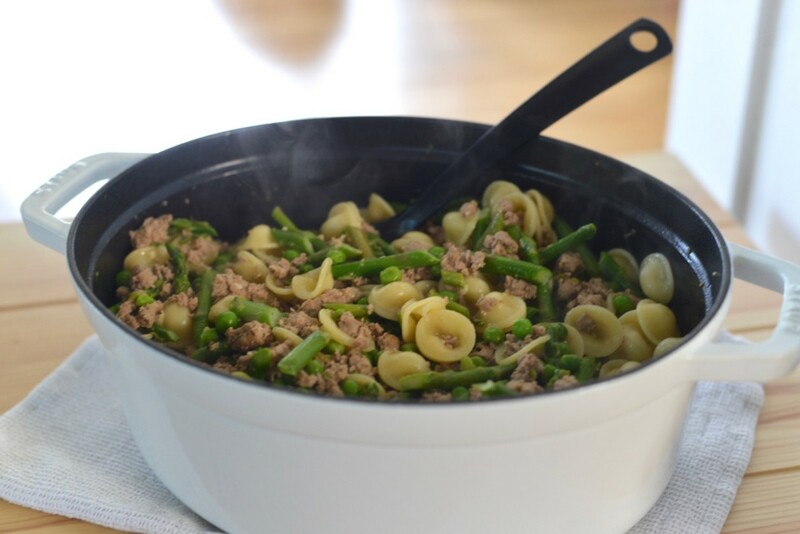 Heat a sauté pan on medium heat and add a tablespoon of olive oil and the 1 pound of sausage you set aside earlier. Cook, stirring occasionally and breaking up the larger pieces with a spoon, until mostly cooked through, about 3 to 4 minutes. 5. Add the peas and half of the asparagus and stir to combine with the sausage. Refrigerate the remaining 1/4 pound of asparagus. Once all ingredients are combined and the bottom of the pan is starting to get brown, add white wine and cream and stir until combined. Once the mixture has thickened and the amount of liquid has visibly reduced, salt to taste, lower the heat and keep an eye on it while cooking the pasta. 6. Cook 1 pound of orecchiette pasta in a large pot according to the package instructions, until just al dente. Reserve 1/2 cup of pasta water, drain, and return the pasta to the pot. 7. Add sausage mixture to cooked pasta and stir to combine. Add pasta water as you stir until the pasta is your desired consistency. 8. Serve with shredded Parmesan cheese, scallions, mint, and any leftover cilantro-lime sauce. 1. Remove leftover asparagus and 1 pound of sausage from the refrigerator. Form sausage into small 3-inch patties (about 1/2 - 1 inch thick) with your hands. 2. Heat a skillet on medium-heat with a tablespoon on olive oil. Sauté 2 patties per sandwich until cooked through and browned, about 3 minutes per side. 3. Remove the patties from the skillet but keep the heat on. Grill slices of sourdough bread until browned on both sides, about 1 minute per side. 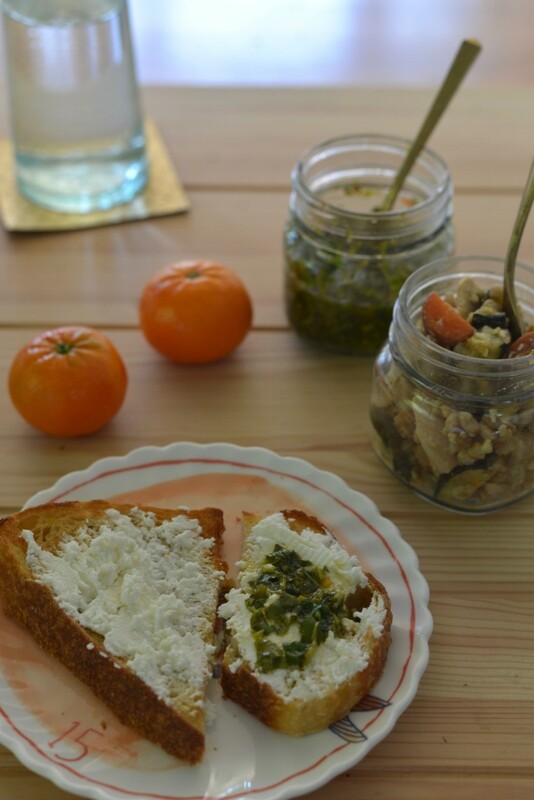 Turn off heat and spread a layer of goat cheese on each slice. 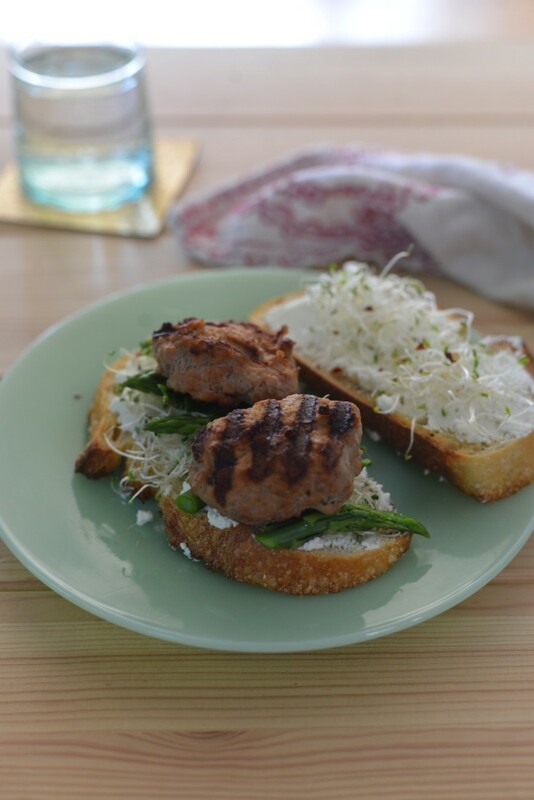 Top with alfalfa sprouts and asparagus, and form into sandwiches with two sausage patties in each. Refrigerate remaining patties. 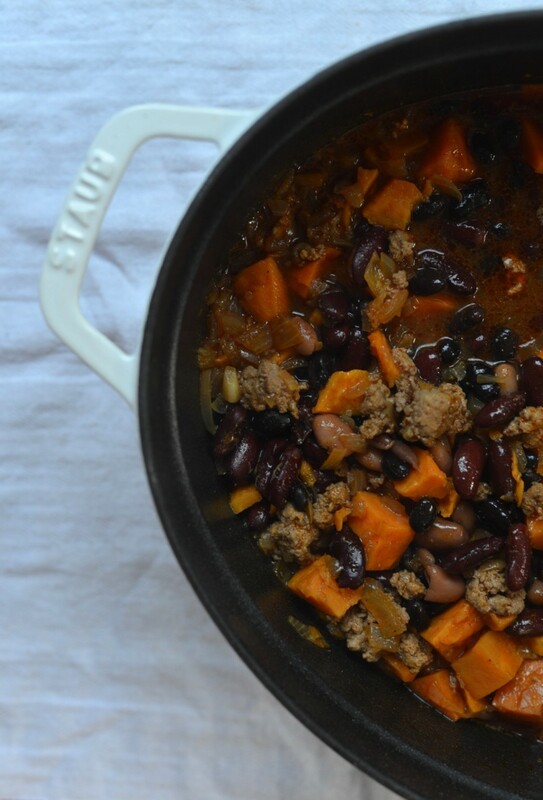 This is one of my favorite dinners because it&apos;s so easy to make, is delicious, and yields a ton of chili. I usually make it on Friday so that I can throw in any leftover vegetables from the week. It should last you a few meals, but if you&apos;re going to be eating out a lot over the weekend, you can also freeze it in individual-sized portions to pull out during a hectic week! 1. Heat a large pot on medium heat and add 3 tablespoons of olive oil. 2. Add the onion, garlic, chili powder, cumin, paprika, salt, and any other spices you desire (this recipe is really flexible and can be done with all sorts of flavors!). Cook, stirring frequently, until onion is soft and fragrant, about 15 minutes. 3. Add the turkey sausage, stir to combine, and cook until browned, about 5 minutes. 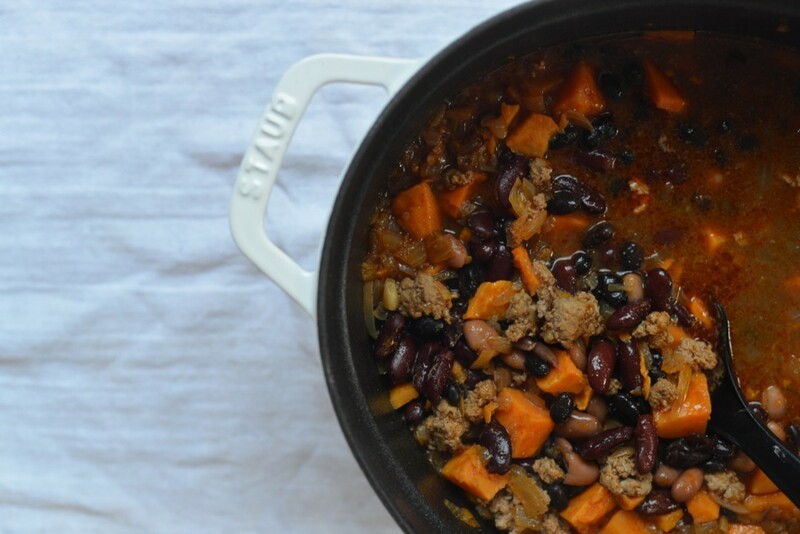 Add the sweet potatoes and chicken stock, and bring to a simmer. Cover and cook for 20 minutes. 4. Add the beans, stir to combine, and cook uncovered for 20 more minutes. You can also add any leftover vegetables you have at this point. 5. Salt to taste and add more spices if necessary. 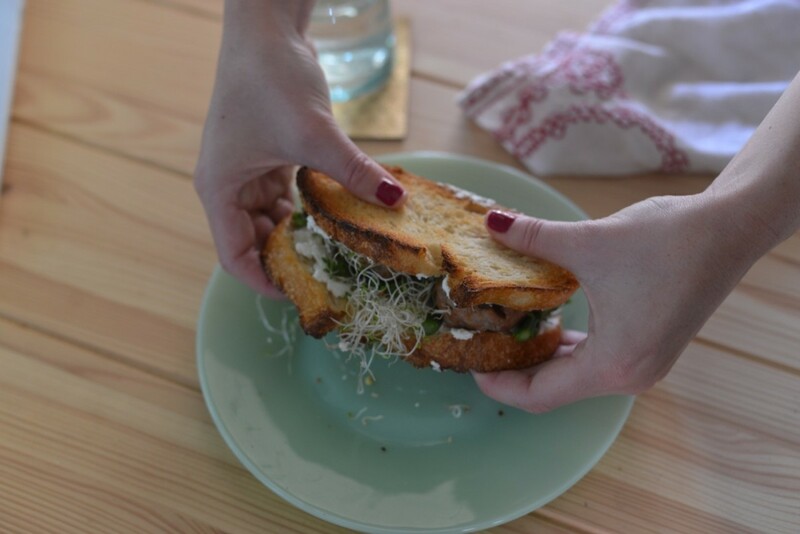 Garnish with leftover cilantro, alfalfa sprouts, and scallions, and serve. If you have leftover Greek yogurt, a spoonful of that makes a great topping, and you can serve it over farro, if you have any left.